Caodaism Organization - What is Caodaism's organizational structure? Spiritual ("the Branch of Soul") which is ruled by God. Note: All Cao Dai dignitaries and officials work for the Executive or Legislative branches of the Church. The Caodaist Church has a hierarchy including a Pope, Cardinals, Bishops, and Priests, as well as additional ranks and titles which have not yet been given official English translations. The hierarchical structure of the Caodaist Church bears many similarities to that of the Catholic Church. This is, in part, because Caodaists claim that the same God created both churches. The Caodaist Church stresses the equality of men and women in society, and does ordain women. However women may not rise to be Pope or a Legislative Cardinal in this Caodaist Church, as the Caodaist doctrine does not allow Yin (female) to dominate Yang (male) spiritually. 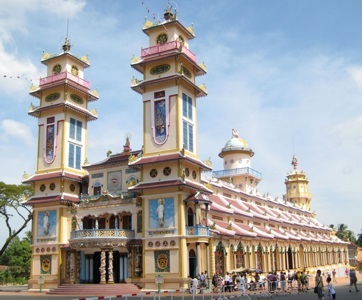 Caodaism was founded in Tây Ninh in 1926, and as a result, this is where the seat of Cao Dai authority remains to this day. 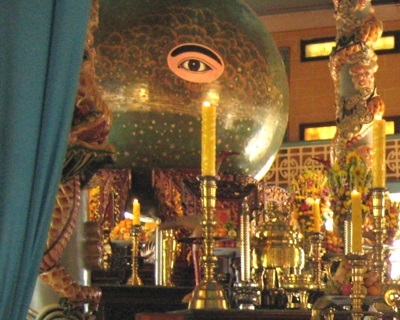 In Vietnam there are six different official branches of the Caodaist Church (the largest of which is in Tây Ninh Province), as well as smaller unrecognized branches. Most of these branches are organized based on geographic areas. In addition, there are also some Cao Dai sects which have broken away the main Caodaist Church (the Tây Ninh Holy See). Many Caodaists opposed Communism during the Vietnam War period. After the conclusion of the Vietnam War in 1975, the Communist government of Vietnam proscribed Cao Dai for more than two decades. Only in 1997 was the Cao Dai granted legal recognition in Vietnam. Please share your comments on this page. The owners/operators of this website take no position on religious issues or controversies, and urges understanding, tolerance and mutual respect between peoples of all faiths and of no faith.